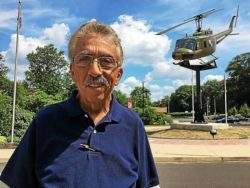 A helicopter is synonymous of all five branches of the service,” said war veteran Ralph Storti, whose monument quest began 14 years ago. WILLOW GROVE, Pa. (KYW Newsradio) — A unique monument that now sits above Willow Grove’s Veterans Memorial Park started as a dream over a decade ago. 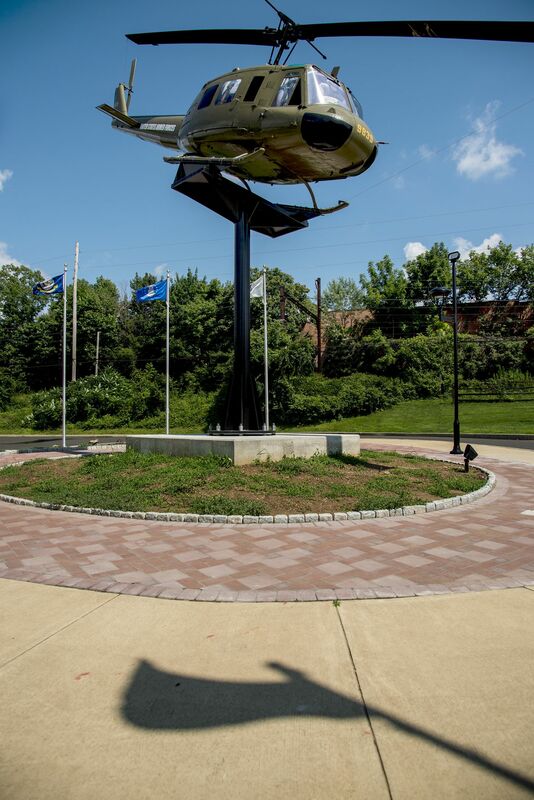 A military helicopter perched over Veteran’s Memorial Park in Willow Grove serves as a monument in honor of all U.S. veterans. See what’s happening on our LinkedIn page. 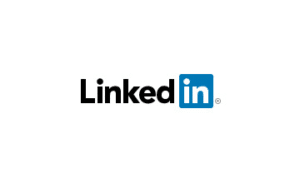 So, what is ISO? ISO (International Organization for Standardization) is the world’s largest developer and publisher of International Standards (Source: https://www.iso.org/iso/about.htm). ISO has several committees, and is comprised of member bodies from numerous countries around the world. Ralph Storti stands in front of the recently completed monument in Willow Grove Veterans Memorial Park in Upper Moreland. UPPER MORELAND >> For the last 14 years, everyone saw the gradual transformation of Willow Grove’s Veterans Memorial Park. Ralph Storti saw the future site of monument honoring those who have served in the military. Fourteen years later, on July 12, 2018, his vision became a reality, and the monument finally took its place in the sky. On top of a concrete foundation in the middle of the park now rests a green Bell Model 205 UH-ID Series Iroquois “Huey” helicopter mounted on a 15-foot curved steel support arm. Written on the tail of the chopper are the words “U.S. Armed Forces.” The aircraft sits suspended in flight with its nose pointed to the ground, as if it were just coming in for a landing or taking off. Inside the helicopter are life-size photos of the committee members who made it their mission to see it hover above the park just like Storti dreamed. To create a 3D effect, there are photos of the pilot and co-pilot’s front and side profiles. Dressed in flak jackets and helmets, they look like a real helicopter crew. In the co-pilot seat, there’s Upper Moreland Township Commissioner Kip McFatridge. Sitting behind him is Caroline Young, of Youngscape Landscaping. To her left is Bob Mathers, of RHM Real Estate. In the pilot seat is Storti, who presided over the committee and willed his idea of the helicopter as a monument into reality. The park’s nine acres were first purchased by neighboring residents shortly after World War II. Their dream was to create a park to honor veterans. Lacking the resources to develop the ground, the organization in charge of the property gave control of it to Upper Moreland Township to create War Memorial Park, which later became Veterans Memorial Park. When Storti joined the board, there was an effort underway to revitalize the park. His initial suggestion of a helicopter was much simpler in the beginning. Obtaining the helicopter for free was easier said than done. Veterans organizations can request them for free, but they’re put on a waiting list. Storti said he was eighth on the list in 2004, and it took eight years for his number to be called. A helicopter flown during the Vietnam War was identified in the Niagara Falls Aerospace Museum. A team from O’Rourke and Sons structural steel business drove up to get it and bring it back down to store in their shop for two years. It was missing parts and needed a lot of work in order to be put back together. Eventually, it was moved to the Youngscape Landscaping facility, where it was painted and made ready to be installed at the site. After 14 years of waiting, the site was ready for a crew to begin the six-hour job on installing the chopper in its new home. Storti gave a special thanks to state Sen. Stewart Greenleaf, R-12; state Rep. Tom Murt, R-152; McCloskey and Faber Landscape Architecture; design engineer Joe Cooke; Upper Moreland Township commissioners, code enforcement and parks and recreation departments; Youngscape Contracting; McFatridge Welding; Storti Quality; as well as developer Bruce Goodman; Scott Contractors; J.G. Petrucci Co.; and O’Rourke and Sons for their help in bringing the helicopter idea to reality. The Willow Grove Veterans Memorial Park site still needs to add the flags of the military branches, along with some other finishing touches before its official opening ceremony later this fall, but visitors have already begun trickling in to look at the new monument. In the meantime, Storti said he hopes those who now come to admire the new addition to the park will never forget the reason why it’s there in the first place — to honor the sacrifices of America’s veterans. "There are men and women that gave of themselves, so we could enjoy the freedoms that we have." WILLOW GROVE, Pa. (KYW Newsradio) -- A unique monument that now sits above Willow Grove’s Veterans Memorial Park started as a dream over a decade ago. Vietnam Vet Ralph Sorti says, 14 years ago, he envisioned a monument for the park. “I did not in my wildest dreams imagine that it would have evolved so much into what we have today,” he said. Atop a 15-foot steel pole, sits a Huey helicopter, with the words, US Armed Forces on the side. Sorti says there’s a reason they chose a helicopter. “Whether you were in the Army, Navy, Air Force, Marines, or Coast Guard, every branch of service has a helicopter,” he explained. It took 8-years to secure the body of the helicopter, and another two years to get the parts to rehab it; Sorti says he never thought of giving up. “When I was in the military, I was a United States Navy Seabee and our motto was, “Can do” and I never forgot that motto,” he said. “That there are men and women that gave of themselves, so we could enjoy the freedoms that we have today,” he added. At 18, Ralph Storti traded in a comfortable family life in Warminster for the Vietnam War and two words: "Can Do!" A phrase coined by the Navy's Seabee construction battalion, "Can Do!" takes just a second to say but is weighted with implication. It can be a declaration, a response to a question or command, a promise to yourself. In Storti's case, it's all three. "There's not enough words to tell anybody how good I feel," Storti said. "It's so rewarding." 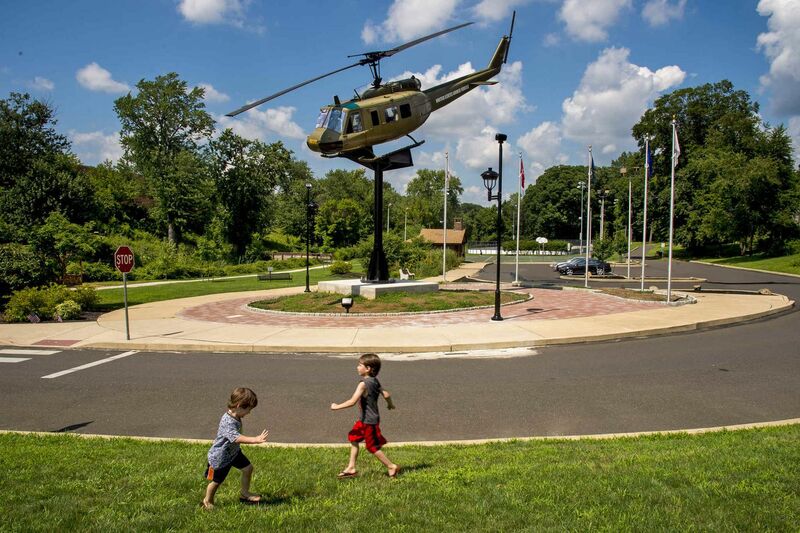 A Vietnam War-era Bell UH-1 Iroquois Huey helicopter in Willow Grove’s Veterans Memorial Park. Ralph Storti, a Vietnam War veteran, spent 14 years working to bring to life his vision of the memorial that would honor members of all branches of the armed services. He had been waiting for that moment — a crowning moment of "Can Do!" — for 14 years. But the story behind the motto goes back further than that. And it's the motto that has kept him and a small team of friends, one of whom is an Upper Moreland commissioner, focused on their vision of crafting a memorial to honor veterans from all five branches of the U.S. military. The memorial, Storti imagined, would be topped with a helicopter, a symbol he sees as inclusive of all military branches. 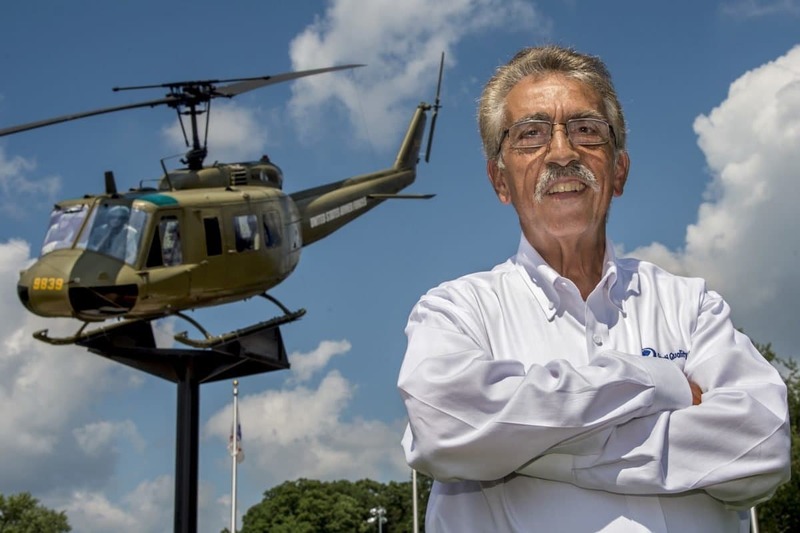 "The one thing that helicopters were able to provide everyone was support," said Storti, a former Peco employee who now owns a Willow Grove-based quality assurance consulting firm. "So whether it was mail that needed to be delivered to people, if there was a rescue mission, if you needed to replenish supplies to people — the helicopter was the easiest way to do that." 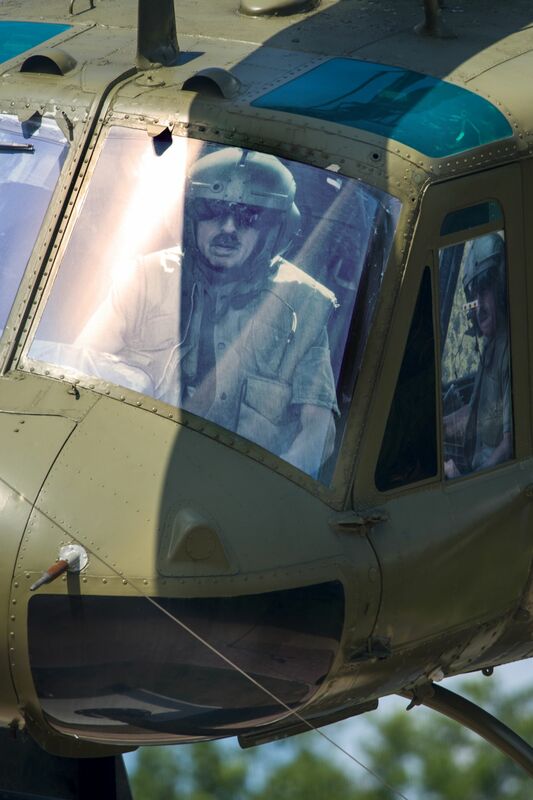 A life-size contemporary photograph of Ralph Storti is in the cockpit of the Huey helicopter. Other community members are pictured in other windows of the chopper. "There's excitement, because you have the opportunity to fly in a helicopter," Storti said. "But there's danger associated with it that you had to worry about." For the memorial, Storti and his volunteer group — friends working in commercial development, insurance sales, real estate, landscaping, and the steel industry — got a ramshackle Bell helicopter, popularly nicknamed "Huey," after spending eight years on a military equipment surplus wait list. Using a lowboy trailer, they drove the helicopter from Niagara Falls to Pennsylvania, spent two more years rounding up parts for repairs, then bought a manual online to figure out how to put the vintage aircraft together. 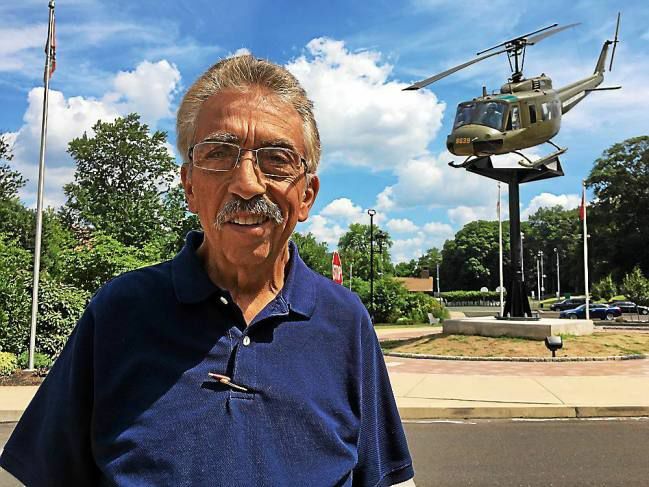 "Ralph is the person who came up with the idea and dreamed it," said Kip McFatridge, Upper Moreland's Ward 5 commissioner, who purchased the helicopter manual and helped assemble the aircraft with Bob Mathers, a real estate agent in Willow Grove. In the last two weeks, a crane set the helicopter, recently repainted a shade of muddy green by Storti and his team, atop a 15-foot steel pole at Willow Grove's Veterans Memorial Park, 220 Mineral Ave. in Upper Moreland, which has served as a site to honor veterans since the mid-1940s. Storti's group had little money to fund the 30-foot memorial, which he estimated cost about $400,000 in private funds to complete. But it got done, he says, thanks to generous donors. 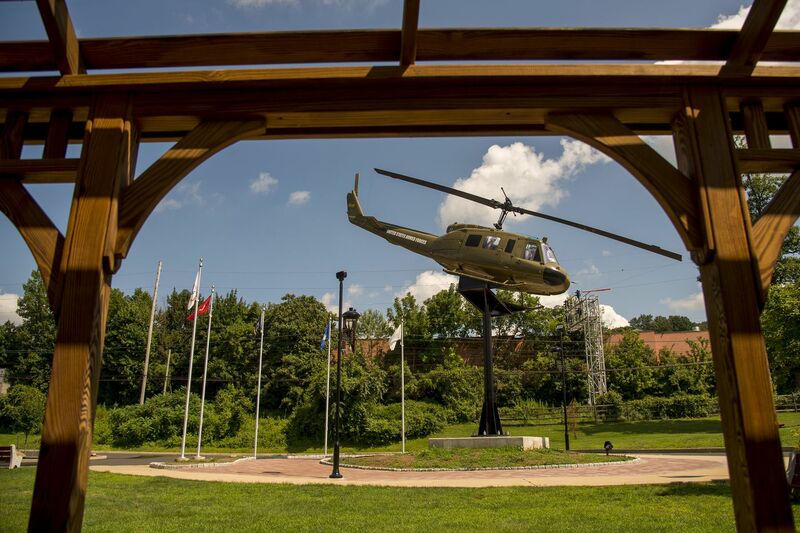 The steel company O'Rourke & Sons hauled the helicopter down from Niagara Falls, stored it on the firm's property for nearly two years, and helped assemble the memorial, Storti said. "It was definitely a team effort," said Caroline Young, office manager of Youngscape, a landscaping company in Willow Grove. "So I would love to try to give everyone credit." On a recent July afternoon, Storti gazed at the helicopter, its splayed feet bolted to a flat sheet of black steel tilted in such a way that made the helicopter look as if it were in mid-flight. Stuck to the inside of the helicopter's windshield were cut-out, blown-up photos of the people who helped the memorial come to life: Storti, McFatridge, Young, and Mathers. A photo of Storti sat in the pilot's seat. He visits the memorial every day, and calls this hulking structure a dream that's finally come to life. "This is my legacy as a veteran to pass on for others," he said. "And I struggle with trying to find the right words. Maybe grateful is the most prominent word that comes to mind for me." Noah (left, 3) and Nate Kolsky, 5, pretend to be airplanes, playing near the memorial. It’s easy to zoom past the Old York Road entrance to Veteran’s Memorial Park in Willow Grove, especially if it’s the first time visiting the park. The driveway sits at a busy intersection, sandwiched between a shopping strip on right and St. Jude’s Religious Store on the left. There’s a traffic light, but the only clear marker is lettering on the stone walls that can be missed until it’s too late to turn. What can’t be missed is the giant helicopter towering over the nine-acre park once the turn into the driveway is made. The green Bell Model 205 UH-ID Series Iroquois “Huey” helicopter sits more than 20 feet high, angled toward the ground to simulate a chopper taking off for a mission. The monument in honor of U.S. veterans is a new addition to the 70-plus-year-old park, and marks a major milestone in a project nearly 15 years in the making. Witnessing Storti’s passion and energy on a sunny Thursday morning, it’s clear the former Navy Seabee could have lifted the helicopter on to the concrete foundation and steel pedestal singlehandedly, if given the chance. Thankfully, Storti did not need any feats of strength, just a little patience and a lot of help. Storti estimated the donations of money, equipment and materials, plus grants and volunteer time, added up to more than $400,000. The opportunity to get the monument installed presented itself around 2003, when Upper Moreland officials started looking at revitalizing the York/Easton road commercial area near the Willow Grove Mall. Part of the plan included installing a driveway off Old York Road that would cut into the park and grant access to a parking lot for the adjacent Septa rail station. The property was purchased by Upper Moreland residents in the mid-1940s and turned over to the township with the understanding that it be turned into a park, and any changes that would affect the park must be approved by the World War II Veterans Association. A new access road would run right into an already existing monument that had been installed in the 1950s, Storti said. Inspired by pictures he saw of a helicopter monument in Porterville, California, Storti presented a couple versions before the final design was accepted in 2004. Then, it was only a matter of getting a helicopter. The federal government gives them for free to qualified veterans groups such as the Willow Grove World War II Veterans Association, but there’s a waiting list. Eight years after making the request, Storti got the call in 2012 that a helicopter was waiting to be picked up at the Niagara Aerospace Museum in New York. He just needed to come get it. It would take nearly six years to get the helicopter ready for public display. When he got the aircraft, much of it had been stripped for parts. Cash was tight for Storti’s modest veterans group, and it took plenty of research and phone calls to find replacements. He hit a gold mine when a representative from Fort Belvoir in Virginia called up and said he had most of the parts, ready to be donated to Storti’s project. As the parts came in, Storti turned to Upper Moreland Commissioner Kip McFatridge, who found a manual online and started working with Bob Mathers to piece it back together. Reassembled, painted and re-lettered, the helicopter sat for two years outside Young’s landscaping business, visible from the Pennsylvania Turnpike, as work started on getting the park ready for the new monument. Storti received a huge boost with donations from developers Bruce Goodman, who built the new Wawa on Old York Road, and J.G. Petrucci, which is in the midst of replacing the demolished Mandarin Garden on Davisville Road with a $75 million luxury apartment complex. Goodman also put Storti in touch with Scott Contracting from Norristown, which donated time and resources to prepare the site and pour the foundation. O’Rourke fabricated and installed the steel pole and pedestal, and supplied the crane that hoisted the helicopter into place on July 12. Next to the monument fly five flags, representing the U.S. Army, Marines, Navy, Air Force and Coast Guard. The finishing touches to the monument will be finished by the weekend, according to McFatridge, including some landscaping and plaques. A formal dedication ceremony is planned for late September or early October, with invitations sent out to military representatives. More details will be made public once plans are finalized, he said.